Margaret Chin, seen in the Council chambers in 2010. Mayor de Blasio’s proposed neighborhood rezonings are an issue in Council races for East Harlem and the area around Jerome Avenue in the Bronx, where community skeptics are grilling candidates to see who’s a reliable ally in resisting the administration’s plans. 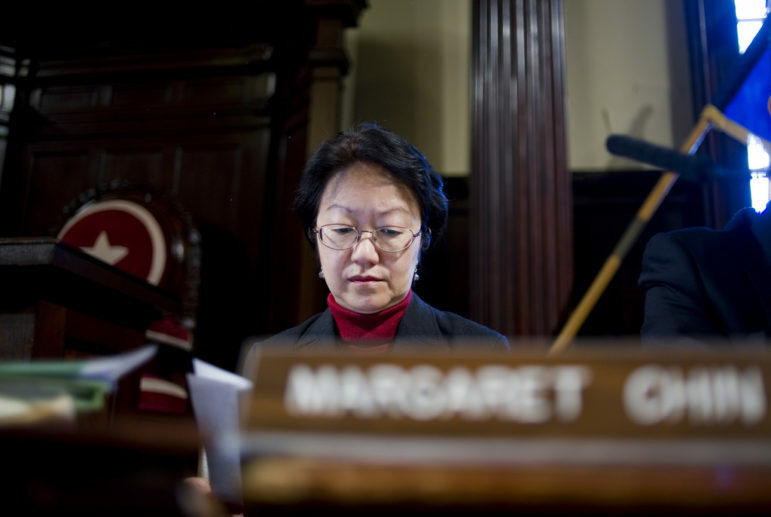 At the tip of Manhattan, where incumbent Councilwoman Margaret Chin is seeking a third and final term, zoning looms large, but in a different way. There, it’s anger over a rezoning that didn’t happen that Chin’s opponents are using against her. In 2008, the Bloomberg administration rezoned a chunk of the East Village and Lower East Side, permitting future growth in some areas but also protecting many blocks with a downzoning. Some Chinatown advocates labeled the plan “racist” for excluding Chinatown and nearby areas also threatened by overdevelopment. Other voices dismissed the charges of racism but agreed that a wider rezoning was needed. Out of that furor grew the Chinatown Working Group, which over several years crafted a proposal to rezone a large swath of Lower Manhattan. The de Blasio administration rejected that plan as too large geographically but agreed to consider rezoning the core of Chinatown only. Rejected out of hand by some players, other stakeholders accepted the deal, arguing it was better than nothing. Chin was one of them. Now plans for soaring skyscrapers along the waterfront of the district’s Two Bridges neighborhood have brought worries about gentrification into stark relief. To build the towers, the developers have to modify a special zoning permit covering the Two Bridges area, but the de Blasio administration has ruled the changes are “minor,” meaning the permit can be amended without going through the city’s full land-use process, or ULURP. (An environmental review process, however, is underway, and the projects still require City Planning Commission approval.) Chin has blasted the city for that decision, and she and other pols have hinted they might sue to force a ULURP review. But Chin’s opponents say the Two Bridges fiasco would never have occurred if Chin had fought harder for the Chinatown Working Group plan. Marte, a consultant, is one of three people challenging Chin in the September 12 Democratic primary. Attorney Aaron Foldenauer and community advocate and filmmaker Dashia Imperiale are the others. It is unclear whether Chin is vulnerable, and hard to say if having three candidates in the race will split the anti-Chin vote or activate other fractures in the district, like the divide between the east side—where Chin has dominated the voting in her previous two races—or the west, where she has lost. Both Marte and Chin have received the maximum possible public funds payment from the Campaign Finance Board, $95,095, putting them on close to equal financial footing. Imperiale has far fewer resources, while Foldenauer had less than $6,000 in the bank at last report. A longtime leader of Asian Americans for Equality, Chin first sought the District 1 seat in 2001, placing fourth in a seven-person race. Chin herself knocked off a two-term Councilmember, Alan Gerson, in 2009. That year, voters were angry over the Council’s vote to extend term limits and an unusual number of incumbents lost seats. This year, concerns about development are stoking challenges to several incumbents. Chin is the chair of the Council’s Committee on Aging, a member of the Women’s Caucus, a founder of the Progressive Caucus and Co-Vice Chair of the Black, Latino, and Asian Caucus. She boasts endorsements by Public Advocate Letitia James, SEIU 1199, Hotel Trades Council, SEIU 32BJ, SEIU Doctors Council, Council of School Supervisors and Administrators, the New York State Immigration Action Fund and, as of this morning, State Senator Brad Hoylman, Council Member Corey Johnson and former State Senator Tom Duane. During her time on the Council, she was the first primary sponsor on 19 bills that became law, covering topics like bike safety, adult daycare and tenant harassment. Marte is not impressed. “We see not only through her legislation but her advocacy with community engagement but also through her budgeting where she hasn’t been proactive,” says Marte. Foldenauer believes the district is overwhelmed by new real estate, from the waterfront to the Elizabeth Street Garden. “The fact of the matter is that we don’t have the infrastructure to support further development,” he says. “The 4-5-6 train runs at, I think, two or three times its capacity every day. If you start building new high rises on the east side and don’t implement the Chinatown Working Group plan then you’re going to have even more crowding on the subways.” Schools and sewage infrastructure are also not keeping up, Foldenauer says. Should Chin be defeated, it would strengthen what already seems like a striking trend in 2017: the loss of gender diversity on the Council. With four women (Melissa Mark-Viverito, Darlene Mealy, Rosie Mendez and Annabel Palma) term-limited, others choosing to leave (Julissa Ferreras-Copeland recently decided not to seek re-election; and Maria del Carmen Arroyo and Inez Dickens left in 2015 and 2016, respectively) and at least two (Helen Rosenthal and Chin) in competitive re-election races, the Council in 2018 could display an even heavier male majority than it already does. Critical to the argument against Chin is the notion that she could have done more to push the administration to undertake the Chinatown Working Group rezoning and head off development and gentrification in the area. Councilmembers Brad Lander in Gowanus and Rafael Espinal and Antonio Reynoso in Bushwick have managed to get the administration to cooperate on a community-generated rezoning by involving agency officials in the planning from the beginning, although whether the rezonings fully reflect the communities’ visions remains to be seen. The administration’s objection to the size of the CWG proposal is neither baseless nor entirely convincing: As City Limits has reported, the Chinatown Working Group’s rezoning proposal covers about .9 miles while the de Blasio rezoning of East New York covered about .6 miles and Mayor Bloomberg’s rezoning of Ozone Park covered about 2.3 miles. Still, it’s not clear that Chin could have forced the mayor’s hand. What is clear, her opponents say, is that she could have fought harder to do so. “It starts with kind of not taking or not allowing the Real Estate Board of New York to pretty much sponsor her reelection in 2013—saying ‘no’ to that because that makes you independent and not tied to any special interest,” Marte says. “When you’re that kind of politician, you have a stronger say of how and what gets developed in your neighborhood.” Chin was one of the top 10 recipients of donations in 2013 from Jobs for New York, the PAC associated with the Real Estate Board of New York, receiving over $230,000. Imperiale makes no promises that she’d succeed in blocking development if she were elected. “What I would do is fight an endless, endless fight to pass this rezoning,” she says. Few districts in the city contain the physical and socioeconomic diversity that District 1 boars. It encompasses Battery Park City, Civic Center, Chinatown, Financial District, Little Italy, the Lower East Side, NoHo, SoHo, South Street Seaport, South Village, TriBeCa and Washington Square. In the statistical area in the south and west of the district, median income is the highest in the city—$123,470. It’s about two thirds lower, and the poverty rate three times higher, in the eastern part. “The main concern facing everyone is the question of displacement,” says David Tieu, one of Chin’s fiercest critics. “We’ll see who’s really going to capture the hearts and minds.” He said the Coalition to Protect Chinatown is looking to arrange a candidate forum. A tenant leader told City Limits a different group is also trying to get the hopefuls face to face. Thank you for this thoughtful article, very helpful. It’s hard to parse through all the accusations, but Chin’s got my vote. On the main item she’s taken to task on, it seems she voted as a compromise to work with rather than against the Mayor, and then fight against instances where the compromise was too weak. Not ideal, but this is politics and her critics seem to insist on perfection, which is lovely in a campaign but not the real world. One of 2017’s most interesting Council contests was triggered when a powerful incumbent decided to step down, setting the stage for a race featuring a pol who gave up office after a felony conviction. Tuesday’s campaign headlines for the five boroughs.